It is still cold and miserable here in the U.K so comfort food is still very high on the agenda in our household. But isn’t it nice when you can have a warming bowl of comfort food you don’t need to feel guilty about? 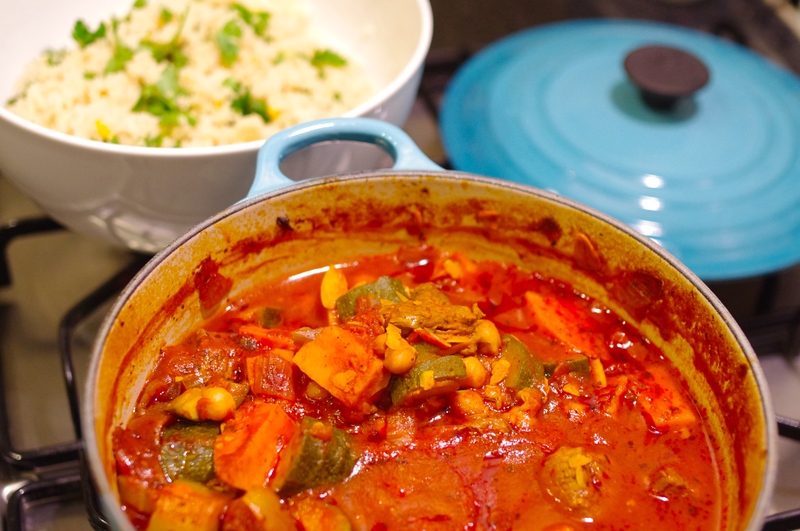 My easy lamb tagine with tender sweet potato, chickpeas and flaked almonds is both healthy and delicious. The perfect recipe for using up store cupboard spices – turmeric, paprika and ginger. The real beauty of this recipe is that it can be made in advance of your guests arrival so that instead of sweating in the kitchen you can kick back with a glass of red wine and enjoy their company. In fact this dish only gets better with time. Make a day or two ahead to give the meat and spices time to mature for a Moroccan inspired taste sensation. Served with my delicious lemon and parsley couscous your dinner guests will be queuing up for seconds. 1) Preheat oven to 150C/300F/Gas2. 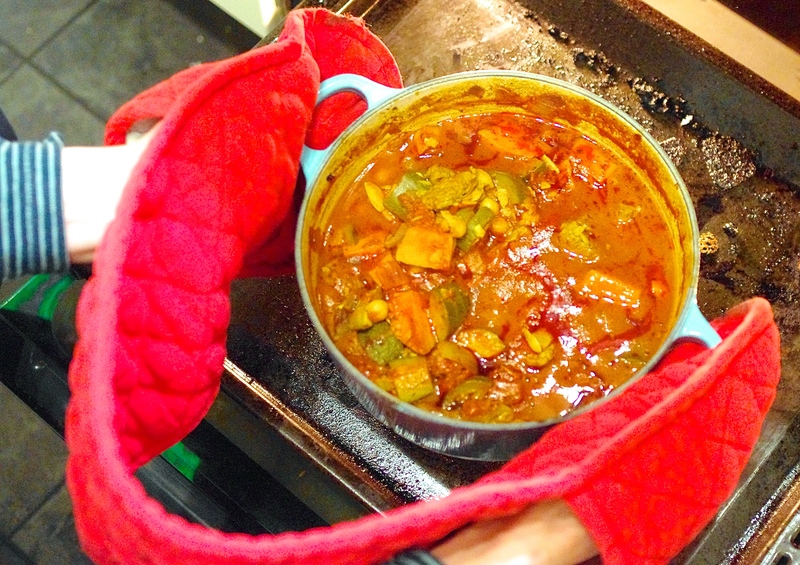 Heat a glug of olive oil in a large casserole/creuset style dish. 2) Fry onion and garlic for ten minutes or until soft. Add diced lamb, sweet potato, harissa paste, paprika, ginger, turmeric and cinnamon and brown the meat on all sides. 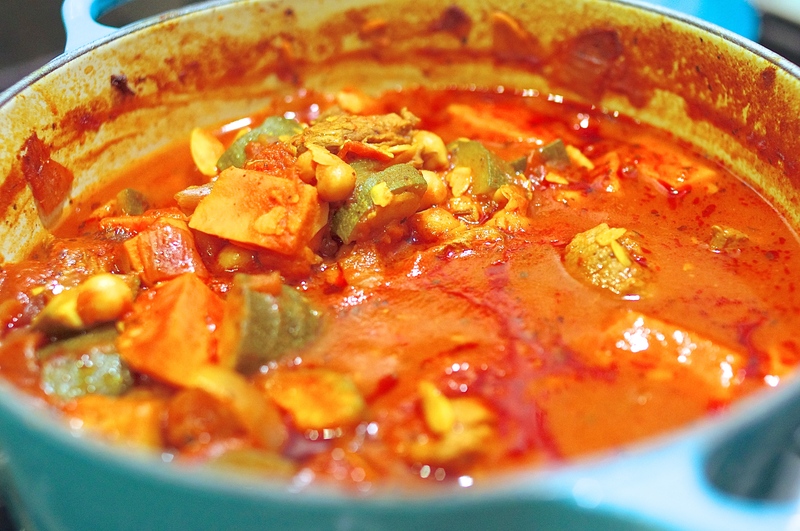 3) Add tin of tomatoes, courgette, chickpeas, flaked almonds, honey and season with black pepper. Stir together gently. Bring to the boil and cover with a fitted lid. 4) Place in the oven and cook for 2 hours or until the lamb is tender. 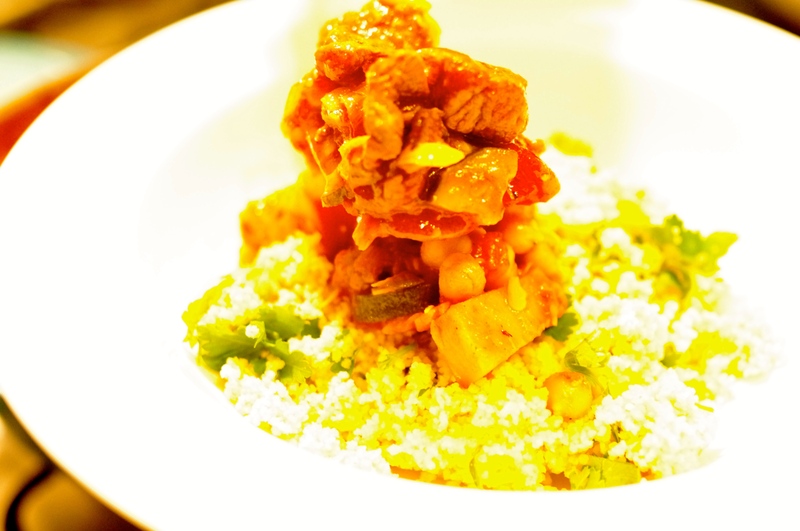 5) Approximately 5 minutes before you are ready to serve the tagine pour the couscous into a medium-sized mixing bowl. 6) Pour over boiling water. Grate the rind of the lemon and add to the couscous. Add the chopped parsley and stir together. 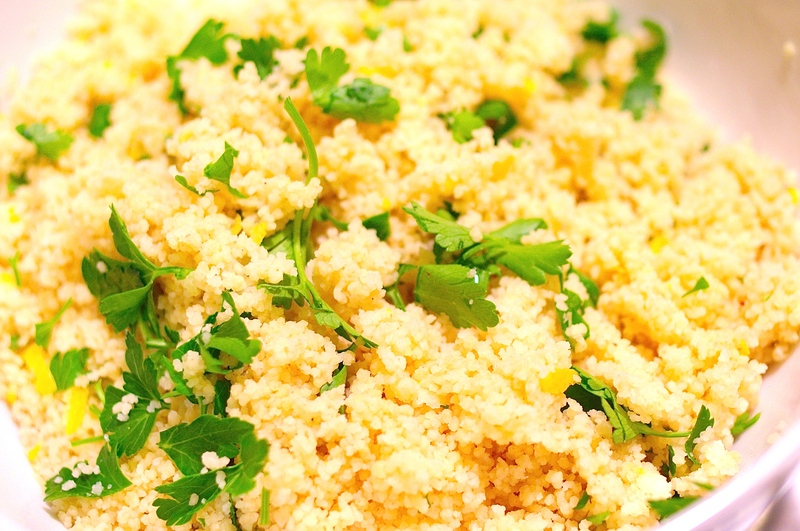 7) Squeeze the remaining juice of the lemon over the couscous and separate grains with a fork. 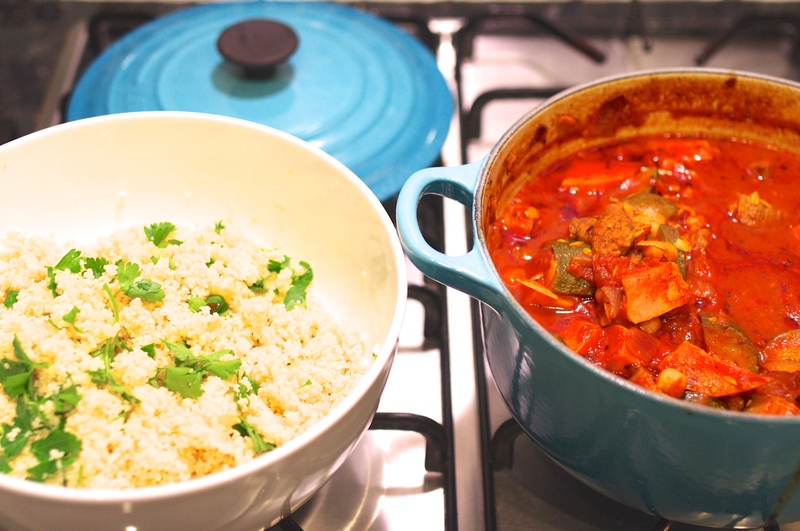 8) Divide couscous and tagine between four large bowls or plates and serve. Delicious! I love this recipe Emma! Matt and I took our honeymoon in Morocco last year and we brought back a tagine pot that we still haven’t used. I’m bookmarking this recipe for future use 🙂 It’s been frigid here in Michigan too… I can’t wait for some warmer weather. Stay warm and happy Monday! Definitely a great dish for these chilly winter days! Great stuff Emma, I could do with this right now! Thanks for sharing this great recipe, Emma! Love lamb and will definitely try this on a cold winter’s evening. 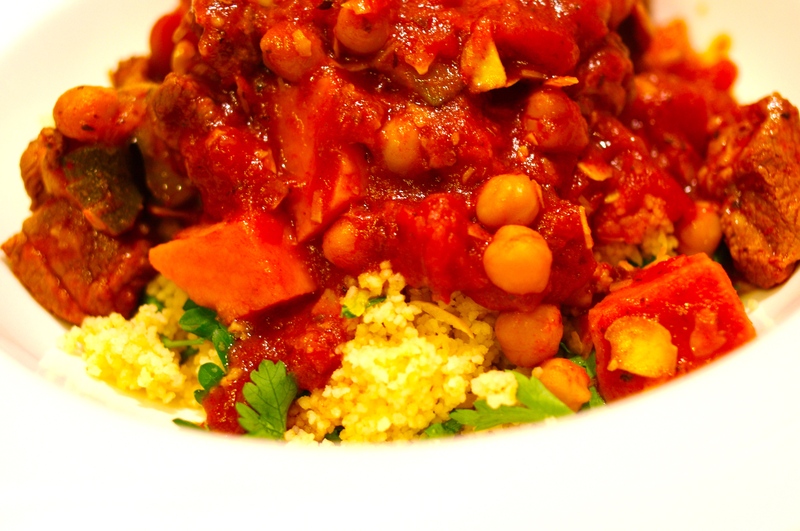 Your tagine looks so good. Wonderful meal, I love lamb!! While I don’t eat lamb (for sentimental reasons), this looks amazing…! Yum! This looks delicious and we’re slowly headed into Autumn weather on this side of the equator so I’m looking forward to making it soon!